So I’ve had the DJI Osmo for a week now and have tried a couple of practice shots….very impressive using it video durban. First up was filming at the local running club. The Osmo comes in a very protective case with 2 batteries and my purchase included a microphone which definitely helps with our video production. 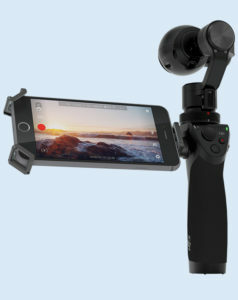 Your cell phone acts as a viewfinder and connects to the Osmo via built in wifi. A DJI app needs to be downloaded before operation. Pretty good don’t you think? The Osmo seems to steady out the faster it goes. Very easy to grip and operate. I still need to view videos on how best to operate the Osmo. The camera will be used professionally next week so we looking forward to seeing the results. We will definitely keep you all posted with the results. If we do not send out another blog this year we wish everyone a Happy New Year!